The regular roof rack consists of two bars across the vehicle's roof, one at the front, one at the back. For carrying kayaks you want them as far apart as possible but that's not usually far enough to stop a long kayak shifting from side to side at speed. The cheap solution is to tie a rope from the leading end of the kayak, down to the front bumper or towing eye of your car. The better solution is to buy an accessory for your roof rack, which usually means J-bars. Kayak bars are sold in pairs, either as straight upright bars 20 inches long or as bars in the shape of a J or V which cradle a kayak. You attach them to the roofrack with a spanner so that they point upwards. Kayak bars on their own are great for short kayaks or vehicles with a long roof. 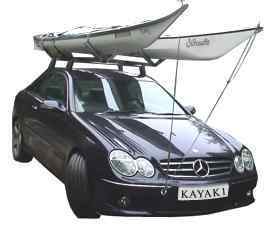 To carry a sea kayak on a sedan car you may want to attach kayak bars to the ends of a six-foot long straight bar and bolt that to your roofrack. You still have to lift the kayak over shoulder height, and maybe over your head. There are roof rack systems for easy loading of one to three sea kayaks. For one sea kayak that might mean one of the roof rack bars has a horizontal pull-out extension. You place one end of the kayak on the extension and the other on the ground, and then you can lift up the other end at your leisure. For two or three sea kayaks you might have a sliding deck. Undo the locking pins and you can slide the whole deck of the roof rack sideways and hinge it down. Then you can load and unload them at a convenient height. Sliding decks are expensive but they do make life easier. Again, see Retail Outlets. The metal bars of most roof racks are covered with a skin of high-density polyethylene (HDPE) which is enough to protect your sea kayak on a short trip. For longer trips it is best to put a layer of dense plastic foam onto the roof rack bars and attach it with waterproof duct tape. The foam cylinders sold in home improvement stores for thermal insulation of plumbing pipes are sometimes dense enough but if not your local kayak store probably sells suitable plastic foam. For convenience, most kayakers strap down a sea kayak with two 6 to 8 foot straps made of nylon webbing, each with a metal cam-lock buckle at one end which makes it easy to tension the strap. No knots needed, except to stop the excess strap flapping in the wind. The buckles on professional camlock straps are made of pressed steel but the buckles on "consumer" straps are usually die-cast alloy which occasionally breaks without warning, particularly after being dropped onto a hard surface. Also, camlock buckles dent your vehicle if you have a careless moment. For an alternative see Tie-Downs For Roof Racks. Probably your kayak is longer than your vehicle. It's easy to tie some dayglo orange cloth to the end so nobody walks or drives into it while you are stationary, which might dent your insurance. It's not easy to find out what legal regulations apply in particular regions. Generally an overhang of more than 4 feet requires a large reflective triangle and/or a light. It's not something to take too lightly - I once came back to a parking lot where I'd left the vehicle and 17 foot kayak in the photo at the top of this page, and found that a Mercedes van had reversed far enough for the stern of the kayak to smash one of the windows in his back door. Drivers of big commercial vehicles often leave about six inches space when they pull up behind you at junctions. If they do that when you have a 19 foot tandem kayak on the roof, you could have a dead driver. Whitewater kayaks are small and tough, which makes life easy. The old guideline was that all the major airlines would let you take two big bags plus an item of sports equipment, which could mean a bicycle, skis, a surfboard or a small whitewater kayak in a rugged bag with carrying straps. These days the usual luggage allowance is often only one or two bags. The maximum length for any one bag is usually 80 inches, often with an excess baggage charge for anything over 62 inches. There is no consistent policy over sports equipment. If the airline allows you to carry it, limits for sports equipment are often 70 pounds (50 pounds is becoming more common) and a maximum length of 9 ft 8 in or 8 ft 4 in. Some airlines have no problem at all carrying a whitewater kayak free, others will do so if you ring them up to say "I want to buy this ticket but only if I can take my bag of sports equipment". Or if you tell them it is a trade sample, because check-in staff are instructed to be nice to business travellers. Many airlines have a knee-jerk reaction against kayaks of any size, shape or description. Probably even they don't know how it started. Rumor has it that the ban is based on an ancient incident when a whole lot of fiberglass slalom boats were crushed in transit. Air Canada, Air Transat, American Airlines, British Airways, Continental, Delta, Frontier and KLM have all banned kayaks at various times. You may be able to get round the ban by claiming it's a sit-on surfboard, but some of them have banned surfboards over 6 ft 10 inches long, or just banned surfboards altogether. We haven't checked to see if any of these bans are still in place, except by having a quick look at the online forums. The whitewater kayakers still seem fairly happy but there are plenty of annoyed surfers out there who have had airlines either refuse to carry their boards or have been charged $100 to £200 extra, per board, per flight. Apparently it's because the airlines are tired of paying compensation for damaged boards, leaving surfers to rent or buy at their holiday destination. Is any airline willing to carry a 17 foot sea kayak, or able to deliver it intact? There are sectional fiberglass kayaks that take apart into three pieces, and they can be great for road travel in places where roof racks are seen as an invitation to thieves, but even if stowed inside two large bags these can be problematic at airport check-ins. The usual solution is a folding kayak or an inflatable, although the airline may charge quite a lot if it's heavy or any part is more than 62 inches long. See above about maximum sizes and weights for baggage. In most warm places around the world, there are tourist beaches where you can rent an ordinary sit-on-top kayak. You can rent classic sea kayaks from kayak outfitters in some of the world's major tourist destinations such as Seattle or Phuket. Sailors and rock climbers use beautiful knots such as the bowline, double bowline, bowline on a bight, Prusik, clove hitch, Italian hitch, tape knot and butterfly knot. 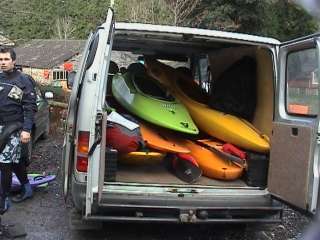 Kayakers use only a few knots, mainly to tie kayaks to a roof rack, attach a tow-line to another kayak, and rig deck lines. The simplest knot of all. It tends to jam if pulled tight, becoming difficult or impossible to undo. So, it is useful for making a permanent lump at the end of a rope, for example as a stopper knot to retain a nylon snap-hook on the end of a tow rope. 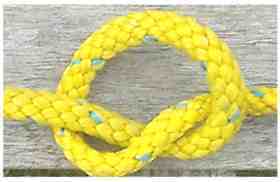 Also known as the Savoy knot or Flemish knot. 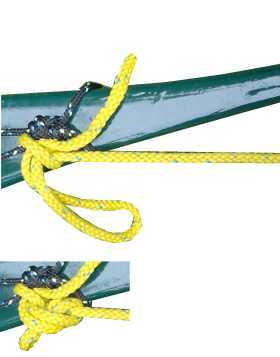 Similar to the overhand knot, but easy to untie even after it has been put under heavy load. 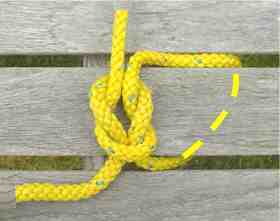 Makes a good temporary stopper knot, for example on the end of a piece of rope which has been threaded through a fairlead or other small hole. It stops the end of the rope slipping back out. Useful for making a temporary loop in the end of a rope. 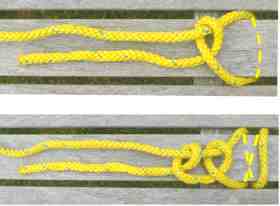 It is made exactly like a figure 8, except that you first fold back a length of the rope so that the end is doubled. This loop is both attractive and easy to untie after it has been put under heavy load. Also called figure 8 on a bight. 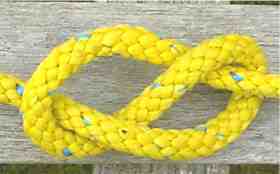 Exactly the same as a figure 8 on a bight except that you tie an ordinary figure 8 leaving a long tail, and complete the knot after the tail has been looped round another rope or other object. Useful when fitting deck rigging. Fairly easy to untie even after it has been put under heavy load. 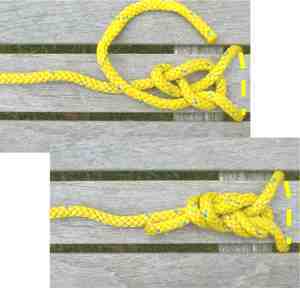 Not much use on its own, the half hitch is used to make various knots. For example, the round turn and two half-hitches in the second photo. This is useful for attaching your kayak temporarily to a post, or tying a kayak onto a roof rack. An easy and reliable way to join two ropes of the same thickness end-to-end; or to tie a short length of rope around something. 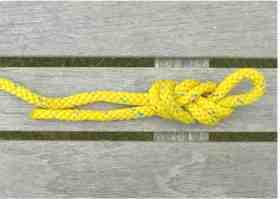 The reef knot can be tied under tension. The mnemonic is "left over right, then right over left".Get it wrong and you end up with a "Granny knot" which is embarrassing but still fairly effective. A neat way of making a loop of cord so that you can use it as a lanyard for a small object such as your car keys. See photo sequence. Otherwise known as the lark's head, cow hitch, lanyard hitch, ring hitch, baggage tag loop, etc. Takes only a moment to do or undo. 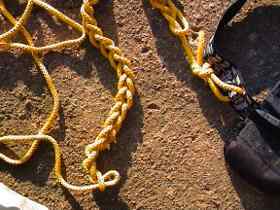 It weakens the rope in a way that makes a real difference to rock climbers but otherwise it's a very convenient way of attaching a loop of cord to anything else. For example, to attach a whistle to a PFD, your keys to the handle of a dry bag, or a paddle park to your deck-lines. Also known as daisy chain or chain sennit. Reduces the length of a 30 foot towline to a convenient 6 feet. Click here for a photo sequence. If you choose not to have a carabiner / snap-link on the end of your tow rope, this is an excellent way of attaching it temporarily to the end loop of another kayak. Just double the end of the rope and use it to tie a half hitch. It comes undone immediately if you pull the end. If it shows signs of coming undone before you want it to, take the doubled part of the rope and tie another half hitch. Most kayakers attach their kayaks to their vehicles with nylon webbing straps with a camlock buckle, made of cast alloy, at one end.If you have had an alloy buckle snap in half for no apparent reason, you may prefer to use tape without buckles, or rope. It shouldn't be too stretchy and it's nice to have one with good handling qualities so you can easily tie and untie it. Polyester with UV shielding is good. Polypropylene from your local car accessory shop is cheap but probably too stretchy. Nylon is also stretchy, especially when wet, unless you go for something quite thick. If you go for rope we suggest a diameter between 5/16" (8 mm) and 3/8" (10 mm). Good-quality rope with a braided sheath is always nice, for example a length of old kernmantel climbing rope. You can get suitable tape or rope from a rock-climbing shop or yacht chandler. See Retail Outlets. For each kayak we use two lengths of 1-inch climber's tape, each six feet long, each with a permanent 4-inch loop in one end, made with a figure 8 on a bight. To tie on, take one length of tape and pass the end with the loop over the kayak, under the horizontal front bar of your roof rack, and back over your kayak so that it hangs down about six inches above the roof rack. Take the other end and wrap it a few times round the roof rack below the loop. Pass what remains through the loop, pull down to tension it and tie it off with two half-hitches. Some prefer a trucker's hitch (nœud tendeur) but this risks crushing a composite sea kayak.